Dinner guests are extraordinarily generous. Where nothing, beyond their excellent and entertaining company is required, they arrive at the hall door all too often bearing gifts of flowers in profusion, fine wines, wickedly luxurious chocolates and, on one occasion, much to our delight, a stuffed boar's head. Only last week Zoli and Viktor surprised us with a miniature herb garden, carefully and immaculately planted in a terracotta pan all ready to be placed on our outside walkway. Instant gardening, without work or worry! In similar circumstances, no more than a week or so back, we became the happy recipients of Saul Frampton's latest book, 'When I am playing with my cat, how do I know she is not playing with me?'. The title, as many of you will now have guessed, comes from the writings of that most splendid of Renaissance essayists, Michel de Montaigne, who, in 1570, gave up his work as a magistrate and retired in isolation to a tower of his chateau convinced that there was "no new pleasure to be gained by living longer". But, in this self-imposed solitariness, Montaigne comes to reject much of the thinking of the sixteenth century and embraces a philosophy where life is to be lived actively, rather than passively, and where, as he discovers, there is to be found a "power of the ordinary" and a "value of the here and now". So, if we are to learn from Montaigne, as indeed we believe we must, then it is the everyday life which is what matters and which counts above all else. And this may be interpreted in all manner of ways: "the touch of a hand, the smell of a doublet, the flavour of wine, the playfulness of a cat", to draw on a few of Montaigne's own examples. For each other, learning to live as we do with the uncertainty which leukaemia brings, the message of Montaigne, explored so delightfully by Saul Frampton, is one which we endorse wholeheartedly. And of everything, it is friends and friendship [with or without gifts] which we value most highly. What a lovely and uplifting post. To be reminded of the "value of the here and now" is a wonderful gift. Thank you! Everything in every moment, I aspire to this... Each moment is exactly the moment of knowledge that feels so close to perfection. I find one of the surest ways to kill joy is to live in anything other than "is" or worse, add adjectives to "is". Philosophy aside, how in the world was your friend able to convince his cat to suffer the indignities of being photogenic? Nicely put, and indeed I've found blogging to be very much a celebration of small things, an opportunity to show the everyday in its best light and to connect with others lightheartedly and benignly. Its reliable undercurrent of gracious humanity has been an unfolding surprise to me. What a lovely herb pot, and beautifully placed. We do so agree that after major changes in one's life, things never look quite the same again. And, with the support of friends, anything seems possible. You are most kind. Yes, the here and now....most often overlooked but priceless! We do so agree about the value of maximising the present. And, we try to live by this mantra. Kotsky is a born celebrity. Posing holds no worries for him. What wonderful sentiments you express here. And yes, the virtual friendships one makes across the Blogosphere are also very powerful and most welcome. Any excess of unwanted guestees should be pointed in our direction. I could always do with an extra crate of Champagne or two! We thought this comment very funny. We shall, however, bear you in mind when we next have a surfeit of drink......after all, it will save us from having to bathe in it!! And, having read your latest post, how much lovelier your porch is. We should love to spend time there and hope that you are having a relaxing weekend enjoying it all. I used to worry about things, until I learned to live in the moment. And friendship matters more than anything. Life's lessons learnt, I think! Jane and Lance, am I to understand that one of you has been diagnosed with leukemia? It is true that one can teach oneself new tricks and not to worry is definitely one that should be learnt. Perhaps it is easier the older one gets? Yes, Lance was diagnosed in September of last year. We have written about it [in part] on our post 'When the Last All Clear is Sounded'. Friendships are wonderful and very important and, there are so many different types .....I have friends that I see on a daily basis, friends that I see, once every six weeks or so, friends that are far away and we see each other rarely and, of course, blogging friends who I have never seen but are, nonetheless real friends.....and, they are all as precious as each other. .....and, what a thoughtful gift and so thoughtful. You will remember them everytime you look out of the window or pick and use some of the herbs. The perfect gift for a friend. I've always loved Montaigne and I do believe that living well us the best revenge against life's slings and arrows. Such a warm and positive post. You are right to live by the day and enjoy even the smallest things around you. It's often these simple things that can make you most happy. In Holland we have a saying 'to make a party of every day'. That's what I try to do and it helps. It brings some sunshine to even the darkest days. I am glad to hear you have a positive attitude too. I hope you will conquer this horrible disease. We do so agree with every word which you say here. In a very short time of blogging, we have become very conscious of the real friendships which exist between people on different continents and of different cultures who have never met. This surely is one of the untold benefits of modern technology. Long may it continue. And we think your grandson is the most perfect gift of all. How wonderful to share Montaigne! And we have delighted in your mantra, which we totally endorse, and in the way in which you have expressed it. We love the Dutch expression, which we had not heard before, 'to make a party of every day'. It is such a very positive saying and one which we shall most certainly remember. We have had some dark days in the past few months but for now the future is bright and we are living it to the full! Yes, yes. I couldn't agree more even though I still cannot arrive at reading Montaigne in French. Something to look forward to! I had a difficult transition when I moved to France. I had left behind my career (one that I had heavily invested in for many years with all of my heart), my family and my friends. What got me through then and still gets me through a down day is to just focus on the smallest of things--cherry jam on a croissant, my dog's silly smile. I know very well how trite this may sound in our cynical world but am also confident that you both will understand. As for the future, well, we don't know. Best to appreciate all that you can while you can! Montaigne in French...well, all we can say is that we have been grateful to Saul Frampton for guiding us through Montaigne in translation. It takes great courage to leave behind family and friends and to move so far away. But, we do believe that one comes through these times stronger both as an individual and as a couple. And all of these new experiences make one's life so much richer in so many ways. As L. P. Hartley said 'the past is another country'....but as for the future...well, let the good times roll!! You speak of things I hold dear - hope and the the enjoyment in the small things, the importance of simple pleasures and centrality of friendships having faced mortality square in the face. It makes your words ring with a truth and authenticity that I find incredibly moving and inspiring. I won't forget your words, and will go back to Montaigne with them ringing in my ears. Thank you. We would probably say that the Leukaemia has certainly sharpened our focus on life, everything seems to be more vital, more colourful, well just more! 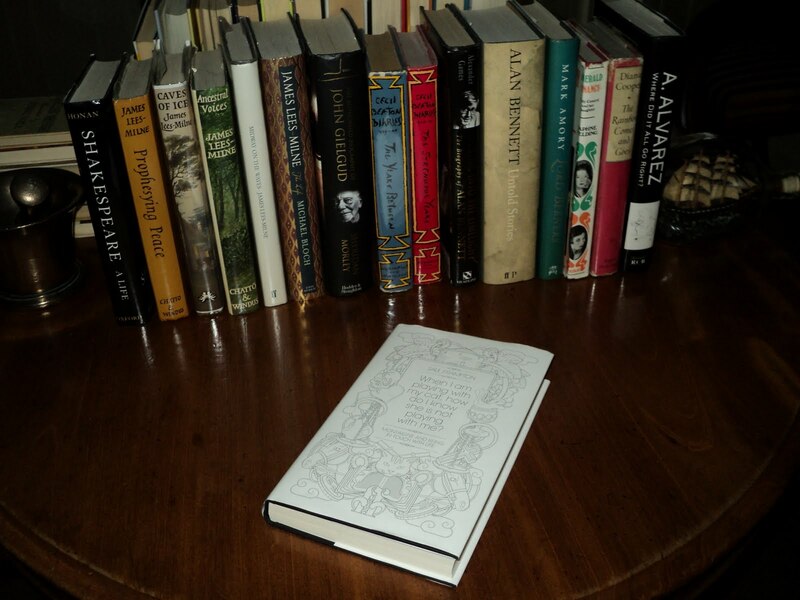 We are so pleased that you share our admiration for Montaigne. It does seem incredible to us that someone living in the C16 could have views which so readily transport to the current day. And, the quotations you give here...truly inspirational. Such a very kind and generous comment. Thank you. Yes, it is in the simple pleasures of life, as you say, that true happiness is to be found. And, perhaps it is through life threatening situations that one truly recognises the fragility and yet the wonder of just being alive. What nice gifts, all rather different, now of course, you'll be joining me with a summer of gardening pleasures. I've already had a crop of one from my strawberry plant! Our herb garden, we are sure, cannot in any way match your vegetable garden. Just a quick snip,a splash with the watering can and the work is done! Congratulations on your first strawberry! With my cancer history I know just what you mean about the importance of living now, not in the future. I haven't read Montaigne since university, but in my training for ministry read a book by a French spiritual writer, Jean-Pierre de Caussade, called "The Sacrament of the Present Moment" which says very similar things. We are so sorry to learn that you have had to face the spectre of Cancer too, and do hope that all is well with you now. We shall definitely seek out Jean Pierre de Caussade. His work sounds to be most interesting, yet he is unknown to us. One of the things I love about about blogging is that it is a great leveller. You don't have to speak in a certain way, look a certain way or be a member of a particular club - yet you are able to make friends with people you would never normally be able to in a million years! I know of some who have actually met - through blogging. Isn't there a saying about a stranger being a friend you have yet to meet? The older I get the more I realise that people are just people - and the rest isn't really relevant. How wise this all is. You are so right about people being people the world over. There may be cultural divides, divisions of background and language but, ultimately, human endeavour and the human spirit are universal. And, as you say, with the internet, one does not need to leave home to share it all!! Before Montaigne, the Latin poet Orazio wrote: "Carpe diem et quam minimum credula postero", that means: "Live the present trusting as little as possible in tomorrow" (this because the people are not allowed to know the future). A philosophy that puts emphasis on human freedom in managing their lives and invites people to be responsible for their own time. Enjoying the present is finally correct also for me. We shall keep a special note of this as it is such a perfect way of thinking in our view and also, it would seem, for you too. Dear Jane and Lance, you indeed have very generous frinds, but then they are reflections of who you are. I know from your visits to my site that your own gifts include the rarest of commodities, taking time to give attention. We all very much appreciate that. Jane and Lance, there are so many perceptive comments here. Tomorrow and all the big issues will work themselves out...yes, we really only need to look to our own lives to see there the play and space and love we need. A beautifully written post. What a lovely post. Your quote of examples from Montaigne is like a poem. I am happy that you have good friends, good books, and each other. It is so true! Friendship feeds on faith and hope and when one is found lacking it leans onto the other until the other can get back up. It is so good when a friend realizes we are not made out of stone or metal. Rather, out of the same matter as they. Our life is like a strange feeling, it tugs us like the wind tugs a sail. It does whatever it pleases with us, and it can lift us to the very heights only to unexpectedly plummet us to the very depths without an explanation. That is why it is so wonderful to have friends. How very kind and generous. We feel very fortunate to have time in spades and it is such fun to visit our 'bloggy' friends. One never knows what they will be up to next! We have so enjoyed reading these comments, your own included, as they do, as you say contain a great deal of wisdom. Thank you for regular contributions to the dialogue. We love to hear from you. Montaigne is , we have found, such a wonderful discovery. There is so much in what he writes that is so relevant to life in the C21. And, yes, we count ourselves very lucky to have each other. What beautiful words to greet us on a Monday morning. They have touched us very much, written from the heart and deeply felt. We hope that the week ahead will bring you much joy and that the highs are without lows. Thank you so much our 'bloggy' friend! Your very kind and generous comment is much appreciated. We do agree that through blogging one comes across so many interesting people writing and posting on such a wide range of topics. Would that there were more hours in the day to read them all! Hi Jane and Lance - it's quite easy to take for granted everyday things such as close family and friends. But your post is a timely reminder that it is exactly those things which have the most profound effect on our lives. Yes, as you reiterate here, the ties which we have with our families and our friends matter so much and are, of course, central to our everyday lives. You clearly write from experience. We do so hope that all is well with you now. Yes, we try very hard to value each day and to live it to the full which often, at the moment, is no more than enjoying the warm air coming in through the open windows and reading a good book. Montaigne and its value of the ordinary are not a bad companion as philosophy goes, but talking about friendship, Epicurus and his "friends and simple food" one isn't a bad one either! You are absolutely right. Friendship and simple food are perfect companions in our book. What a wonderful post, and such an uplifting message to start the week. Yes, it is so important to embrace the "value of the here and now". I feel it especially as I have family members who tend toward gloominess and dwelling on past regrets. I feel the constant need to remind them of the importance of living in the present and enjoying the moment. Thank you for sharing! Thank you so much. It can, indeed, be something of a problem sometimes to persuade people of the need to live and enjoy the 'now'. This is particularly so in Hungary where natural pessimism abounds and where the worst is always on the point of happening. lovely post...hope you are both having a great weekend!! Thank you so much. And yes, blue skies wall to wall and the windows open wide. Perfect, as we hope things are with you. I was rather emotional after reading this post. I find your writing full of warmth and honesty which is very refreshing. Thank you. We are so very touched by your comment for which many, many thanks. But we are sure that you are the same - people [and here we should always include animals] come way before possessions. And yes, thank you, we had a wonderful weekend as we hope you did. We are delighted that you enjoyed the post. Yes, we are in complete agreement here, friendship is to be cherished. Gracias por tu visita!! Encantada de conocer tu completo blog. Thank you for signing up as a Follower. We look forward to welcoming you back again. We are delighted to have discovered your blog. I absolutely love Montaigne, although I haven't read him in so long. The Russian translation was a bit difficult to read, but you could feel his wonderful individuality and spirit. We are pleased that you share our newly found enthusiasm. Montaigne is rapidly becoming our hero of the hour and we are now inspired to read more. My dear Jane and Lance- as always, this is such an enchanting post. 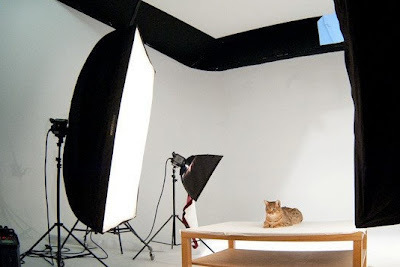 First of all, I wonder how your Russian friends could manage to make Kotsky the cat sit still during the photography session. I have adopted a neighbour cat called Mouche. If I ever tried to capture a professional photography with him, I think I might end up with a bag of claws. Zoli and Viktor sound like generous and kind guests. I've always loved herbs in the kitchen. It not only brightens up one's kitchen but also it comes in handy when you are making a salad. I was admiring your books at your bookshelves. Incredibly well read as one expects, of course. 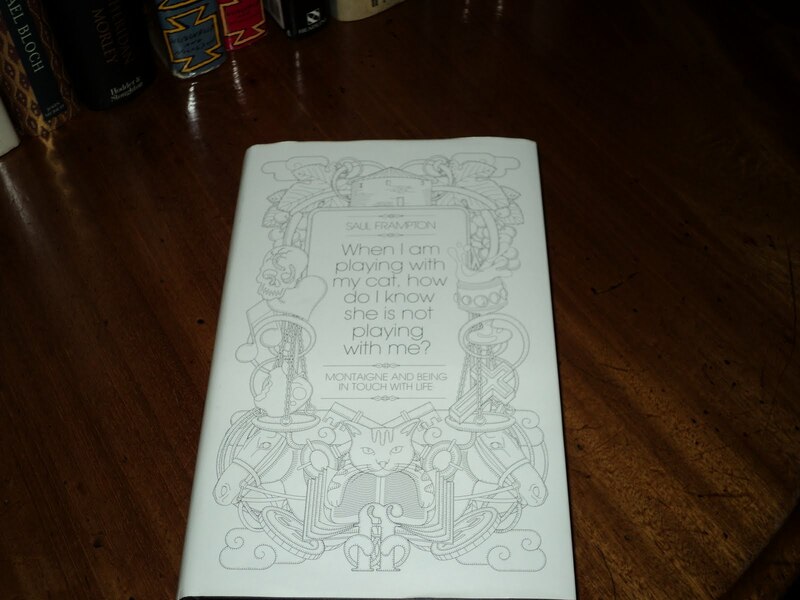 I've read incredibly good review about Saul Frampton's 'When I am playing with my cat, how do I know she is not playing with me?' in the Times newspaper one weekend. It's in my shopping basket so to speak. Now, you recommend it - to me it's a stamp of approval - I shall definitely be reading it. Isn't it incredible that we still find these ancient writings still relevant today - Marcus Aurelius another ancient man comes into mind...their humanity and wisdom can be so comforting...by reading their books, one forgets one's sufferings and fears. I can't imagine what could be more delightful than finding a solace in a good book. Thank you my dears. How lovely to have been adopted by Mouche. We wonder what kind of cat he is and imagine that he could be a ginger one from what you write as we always think that they are closest to the lions. Yes, we urge you to get a copy of Saul Frampton's book as it is not only very readable but is witty and cleverly researched, drawing from all Montaigne's essays. It is so true, as you say, that History is still relevant in so many ways, but whether we learn from it is, perhaps, another matter entirely. Linda, you are always so very, very generous with your comments. We do so appreciate your kindness and yes, we too are amazed at the wonderful friendships to be found throughout the blogging world. We value them all, and yours by no means least. I have had the best half hour reading your blog and all the interesting, kind and thought provoking comments from and to readers. You are outstanding in the blogsphere for your beautiful and impeccable manners, in responding to each writer. I, like A Super Diletante, am going to read Soul Frampton's book. I love to receive book leads from those I respect and like. I could not but help notice James Lees-Milne's diaries. Does he know that I'm his biggest fan? I read his diaries on an annual cycle, usually starting on my birthday in November. They get me through the Winter months. I have always been a firm believer in the everyday things of life. These are the most important because we do them everyday! Perhaps Montaigne should have listened to Johnson and moved to London, eh? How nice to read your comment on my post. Yes indeed, I do grow some clematis amongst my climbing roses. Clematis are somewhat of a stuggle here because it is so warm, but I have been successful with some of them. It sounds as if you lead very exciting, intellectually stimulating and fascinating lives. I know Montaigne, but only briefly...lukemia, I know only too well. Take care. Helen, your kind and far too generous remarks are really appreciated. Thank you so much, and for taking the time to read our blog. One of our most recent, and greatest, pleasures has been the discovery of your own blog and of 'meeting' you, albeit in the virtual world. No, we do not know of the film 'The Dead' but we shall certainly investigate it. Possibly we shall be able to get hold of it on DVD. We are certain that you will enjoy Saul Frampton's book. It is highly readable and very engaging. We have long been 'fans' of James Lees-Milne and are fortunate to have all his diaries in First Editions. If you have not come across it, then Michael Bloch's biography of J L-M is very well worth reading. It is odd that he, J L-M, should have married, but his wife, Alvilde, was a great gardener, and at one time worked on two books with Rosemary Verey. You are so right. It is the ordinary, even the mundane things of life, which make it what it is. Or perhaps what we make of them. Now that, indeed, would have been interesting! Yes, we can well see the problem for you with Clematis in your climate for, in our experience, they are rather inclined to prefer soil which does not dry out and are, of course, very heavy feeders. Thank you so much for your kind comment which is so appreciated. We are sorry to learn that you too have a knowledge of leukaemia, but glad that you know Montaigne! We do recommend Saul Frampton's book which we have found highly readable. Friendship is a rare gift that we give ourselves only to see it being re-given by our friends to themselves. It is wonderful to have compatible company,pleasant conversation, some wine and a little food to pass time pleasantly. Exchange of gifts between friends is always a pleasure, as the finer the friend the more appropriate and thoughtful the gift which delights us as it highlights how well our friends know us. Montaigne is a favourite of mine and like him, I do like a good quote (as you know from my blog!). We are delighted that we share a love of Montaigne. And yes, so many perfect quotations that it is difficult to know which to choose. As we connect with you across so many miles we quote...."Travel is in my opinion a profitable exercise. The soul is there continually exercised in noticing new and unknown things, and I do not know a better school...in which to model life than by constantly suggesting to it the diversity of so many other lives, fancies and customs, and by allowing it to taste the perpetual variety of forms of our nature". This sounds a most delightful book, I shall look for it myself. Only one of my regular dinner guests brings me books, a wonderful man who also never forgets to add a special bottle to the table. Bottles are a very common present, others bring me plants from their gardens, a few bring chocolates. I am very glad to be given any small token of the guest's esteem but mostly I like them for their wit and charming conversation. We really do think that you would enjoy it. We found it completely absorbing, highly entertaining and thought provoking. And, we know that it was chosen for us with much care. Your dinner guest who arrives with books and bottles sounds an absolute delight. But, like you, we value our friends for themselves and not for what they might bring. You have written about living in the moment in such an uplifting and joyful way. Often it takes illness or tragedy to make us really appreciate what is important in life, so others can sometimes associate it with sadnesss, when actually living in the moment is completely the opposite as you demonstrate through your wonderful blog. The herb garden looks lovely and is a very thoughtful gift. Comrade Kotsky is the most fabulous name for a cat! Carol, your very kind words are much appreciated. And yes, what you say is absolutely true and we agree with it wholeheartedly. We were, as you may imagine, thrilled with the gift of the herb garden which, happily, is doing very well. Comrade Kotsky is the most amazing cat and is thoroughly spoilt by our Russian friends. "the touch of a hand, the smell of a doublet, the flavour of wine, the playfulness of a cat"... I like this! Friendship is really one of the most valuable things in life..
We are so pleased that you have enjoyed the post. We totally agree about the irreplacable nature of friendship. The book's title is most intriguing, but makes perfect sense when one has read it. Such a lovely reminder to appreciate those things that bring us joy in the momment. I am amazed that Comrade Kotsky will pose for photographs. I love our dog but the cat is another story. There is no "play" without claws or teeth involved where I am concerned. I am certain he is working on a plot to remove me from the household so he can have my husband all to himself. Comrade Kotsky does seem to have unusual habits compared with any cat we have known or owned. He poses, plays, enjoys the shower, sleeps in a furry den and even 'sings'. He is a celebrity in the making! As for your cat....stealing the affections of another...at least you know his game!! Linda, you say the kindest things and each one of your posts gives us enormous pleasure. You quoted Montaigne! Marvellous. One of my favourite quotations by Montaigne is: "He who establishes his argument by noise and command, shows that his reason is weak." Anyway, as an aside..... the gifts proffered by your guests are lovely! You are very lucky people. We are delighted that you enjoy Montaigne too and the quotation which you include is absolutely splendid. We do agree about the gifts. Unnecessary but lovely to receive. I have a feeling that you two are wonderful hosts as well:) Comrade Kotsky what a fun name for a cat!!! Yes, not only a fun name but a highly indulged cat who is, in fact, lovely. We wish he were ours but our Russian friends are not parting!! The herbs, as you may imagine, have already been put to good use. What a happy start to the day! I have found your blog by a circuitous route and am so pleased! I'm looking forward to reading your past posts. We are delighted that you have signed up as a Follower and have returned the compliment. We look forward to continuing the dialogue as we share our interests. 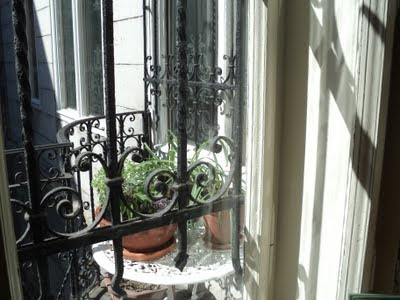 It's always a pleasure to visit you, so, I'm bringing a pot of lavender to join your little herb garden. Thank-you for your lovely post on my blog - you are my 25th follower which feels pretty special to me. Will look forward to your visits. Thought I'd hop over to yours and am so glad I did. What beautiful words. How lovely your pot of Lavender will look. Indeed, we might just purchase a second one to join it, you have inspired us! We are so thrilled to welcome you as a Follower. We enjoyed reading your posts enormously and look forward to future posts and further conversation. We do hope that you have a Happy Day! Such sage advice, to learn to appreciate what we have. Without that knowledge there really is not much point in anything else. We were so obviously reminded of it by a recent visit from a friend, of whom I am very fond. He has huge wealth, but is clearly not a happy person. What is reassuring however is that he acknowledges it in our relationship - the one between my other half and me - and is determined to be "at peace" himself, (and I don't think he means in the sense of finality sometimes attributed to that). The example you give here of your friend is, alas, not uncommon. The cliché of money being unable to buy happiness rings true so very often. It is to be hoped that with the support and interest of you both he will find contentment. Such a very kind comment for which many thanks indeed. And you are so right, so many things cannot be changed so it becomes useless to worry about them. Like you, we really do feel that it is so important, whenever possible, to try to appreciate today. A wonderful, thoughtful and uplifting post. The small ordinary things of every day are truly to be treasured, and being happy in the here and now is something to cultivate. So glad to have discovered your blog, and thank you so much for your sweet comments on mine. Wishing you well. Wisdom comes from a life well lived and your wisdom is boundless. I certainly embrace all that you have written...life is short...and happening now...let go. tune in, have fun! We are so pleased to read that you are in agreement. Cultivating the here and now.....a lovely idea. Yes, we must all work at it. And, thank you for your kind and generous comment about our blog. We very much enjoy our visits to you. Let go....now those are indeed words of wisdom and, happily is a lesson we have learned! Hey! Just a thought whilst I was perusing your blog - you are very meticulous when it comes to replying to reader's comments. It might be worth you using some software called DISQUS. It means that you can respond to each comment personally, rather than just having all the comments in one big list (if I have described that clearly?). It also sends an email notification saying that you have responded. It is easy to install, and it would enable your readers to benefit from your efforts! Thank you so much for taking the time and trouble to inform of this piece of software. We shall certainly consider it, although we are pretty much Luddites when it comes to anything technological. We have marvelled at Disqus in action on your own blog since, as you say, it enables each comment to be dealt with separately which is far less confusing all round. Just read your comment on my blog. You asked me if I combine roses with clematis. I did not until this year. I have only started gardening three years ago. So I am still a novice. My mother advised me to combine my New Dawn rose (covering the veranda of our little garden house) with a clematis. I chose the Noblis, because it has a beautiful burgundy colour. The plant is still very small and only had a few flowers this year. I can imagine that in a few years time it will look lovely! It seems incredible to us that you have only been gardening for three years since, from the small glimpses we have had, your garden looks to be fully mature. How strange that you should mention New Dawn.When we gardened in Herefordshire, it was a favourite of ours and we grew Clematis viticella 'Étoile Violette' as a companion plant. Dark violets/purples do, as you say,look lovely with this rose. Just another idea. A combination that we found to be stunning was Clematis 'Comtesse de Bouchaud' together with Cotinus c. 'Grace'. I think you and Montaigne make good points here. Not only does leading the life of an outsider give one a better understanding of our present society from this outward, 'objective' perspective, I also can see the use of living in the moment; many, espcially romantic and nature-lyrical poets as well as for example the school of Zen have emphasized it, too. Good post that makes one dream, and I also like the alliterative title. We too feel that Montaigne has much to offer in his observations of life and where he places his priorities. We like your reference to 'leading the life of an outsider', a position we identify with living in Budapest which is, of course, so very different from our own country. However, this is not something we should wish to change. If you could be any historical or current character who would you be? Which character traits annoy you? Name one thing that you would change in yourself? Enjoy the fun, and if you have time, can you post your answers as a 'comment' on my blog so that I can get to know you better. All is revealed on your blog. Dear Jane and Lance, Kotsky is fabulous! What a stunning looking animal! I must get that book for my dad and your herb garden is a wonderful and thoughtful gift. Kotsky is indeed fabulous, almost a small lion when viewed at close quarters. Yes, we love the herb garden. It smells wonderful in the sunshine and our housekeeper happily snips fresh basil for her wonderful Gazpacho. One thing is for definite, we do not wish to swap our dinner guests for yours! But how strange that it is not the custom to give gifts on such occasions in Middle America, since we are sure that you would not arrive empty handed. Thank you for your kind words, it was a horrible day in New England yesterday, today is just the opposite. We hope that everyone is able to rebuild in these tough economic times. To riff on the 20's song, fifty thousand (million, and more!) Buddhists can't be wrong. The present is all we have, best to pay attention. Kotsky is stunning. I have a stunner as well, but he would rather poke at the camera and photographer than pose! We are so relieved to hear that today has been an improvement on yesterday. As you say, these are very difficult times, made no easier by having to rebuild lives. So few people,it would seem, are content with today, this moment even. C21 life appears to demand that we should be for ever looking and moving forward. To what? we wonder. Perhaps at some point your cat may feature on your blog? Something to which we could look forward!!! Thoughtful gifts brought by friends coming over for dinner is always such a lovely gesture and gives so much pleasure long after the guests have departed. This is exactly right. It is the memories with which such gifts are associated which continue and that is so much part of the pleasure. Well, I'm sorry to say I have not heard of Montaigne until this very moment but I'm thoroughly intrigued now and will serach he and Mr. Frampton out immediately, the subject is a fascinating one and I'm so happy Montaigne discovered that the opposite of passivity is the way to go, he learned to appreciate the blessings that we have all around us...I love when that happens! Enjoy your sweet little herb garden...such a lovely gift (on a very lovely balcony!). But, Jessica, isn't this the most wonderful thing about blogging, how it is possible to discover all kinds of things previously unknown? Certainly, it happens to us all of the time. Yes, we should certainly recommend Saul Frampton's book as a very good introduction to Montaigne. Very astute on Montaigne; yet like your citation of Aristotle recently at my page, it's clear that the perception is in your hearts and finds companionship, more than persuasion, in his works. Then, as you show, we enjoy finding a companionable disposition fulfilled by refined mastery of its chosen form. A beautiful and stunningly modest posting. We are so deeply touched by your fulsome praise here. It is much appreciated. You write, so perceptively, that the ideas and life of Montaigne resonates so closely with our own and this does, perhaps inevitably, endear him to us. Indeed, although Montaigne inscribed the phrase from Lucretius [in his tower]:'There is no new pleasure to be gained from living longer',he did, nevertheless, go on to embrace life in all its vitality and simplicity. And so it is for us. Life is indeed measured out in coffee spoons, in stolen moments, in other people, in the here and now. I must get my hot hands on this book pronto. In a world which is increasingly challenging, the words of Montaigne, so ably translated and explained by Saul Frampton, offer hope. Comrade Kotsky indeed! As always, a fascinating and informative post. I am not familiar with Montaigne I admit, so have added the name on my "Things To Do When I Am Next In the Library List". Along with that of Frampton. A thought provoking post and the I am glad to read of kindred souls who also treasure the blessings of today and now. We were not at all familiar with Montaigne until presented with this delightful gift. However, we now find ourselves increasingly intrigued by him, his ideas and his way of life. We find much that we can identify with, particularly the joy of simple pleasures.